Nevada is a strange state when it comes to towns and cities. The reason is because the population of the state is so incredibly sparse outside of the two primary metropolitan areas - Las Vegas and Reno/Carson City. The result is that Nevada is surprisingly few towns and cities. When traveling in Nevada, it is normal to have 50-100 miles between towns outside of the major metro areas. This section of Exploring Nevada will highlight, in words and pictures, the various cities and towns in Nevada. So let's start exploring the towns and cities of Nevada. Austin : An historic town located in Central Nevada that has a wonderful location for outdoor recreation. Baker : A very small town located just outside of Great Basin National Park. Beatty : Located on US Highway 95 midway between Tonopah and Fallon, Beatty is also close to Death Valley National Park. Belmont : Located in Central Nevada to the north of Tonopah, Belmont is one of the best preserved ghost towns in the state. Caliente : A small town with a great location that is located to several state parks as well as the scenic Rainbow Canyon. Elko : Located on Interstate 80, Elko is the largest city between Reno and Salt Lake City. Ely : A outdoor hub for recreation in Nevada, Ely lies in the beautiful Steptoe Valley of eastern Nevada. Eureka : Located on US Highway 50, Eureka is a historic town in a great setting for outdoor recreation. Fallon : Located at the junction of US Highway 50 and US Highway 95 in an agricultural area of Nevada, Fallon is a busy place. Fallon is also home to the Naval Air Station Fallon. Hawthorne : Located just to the south of scenic Walker Lake, Hawthorne is home to the sprawling Army Ordnance Depot. Lamoille : Located at the base of the Ruby Mountains, Lamoille is a jumping off point for outdoor recreation. Laughlin : An affordable and fun place to visit and whose location on the Colorado River offers plenty to do away from the Casinos. McGill : Located on US Highway 95 midway between Tonopah and Fallon, Beatty is also close to Death Valley National Park. Mesquite : Located on Interstate 15 to the east of Las Vegas and near the Arizona/Utah border, Mesquite is a popular town for travelers on a budget. Pioche : A historic mining town in eastern Nevada that has a busy downtown and a great location for outdoor recreation. Tahoe City : Located on the north shore of beautiful Lake Tahoe, Tahoe City is a year-round outdoor recreation spot in the Lake Tahoe Basin. 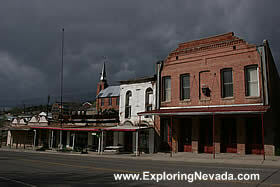 Tonopah : Located on US 95 midway between Reno and Las Vegas, Tonopah is a small town rich in mining history. Virginia City : Located between Reno and Carson City, this historic mining boomtown is a great destination to visit. Wells : A small and historic town located at the base of the Humboldt Mountains. Yerington : A small town in west-central Nevada, near the Sierra's and the Walker River Scenic Drive.